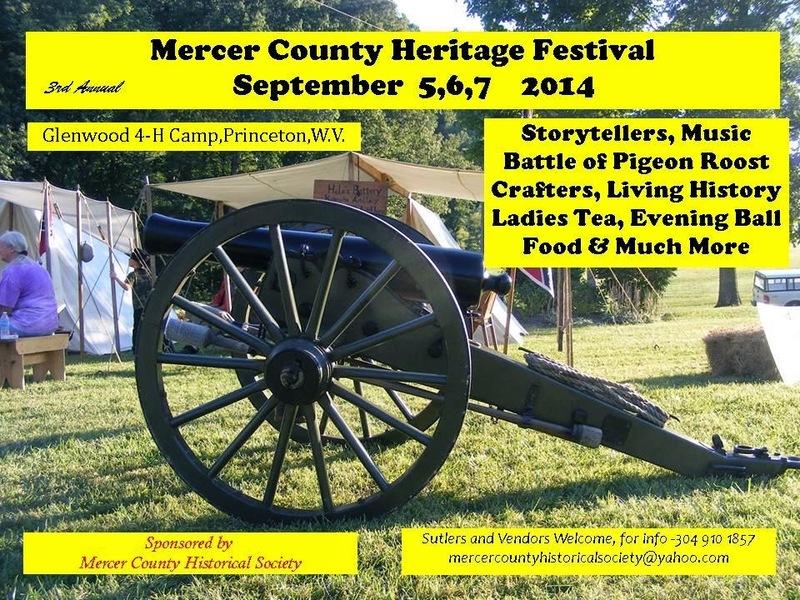 Guess where I'm going this September 6th! 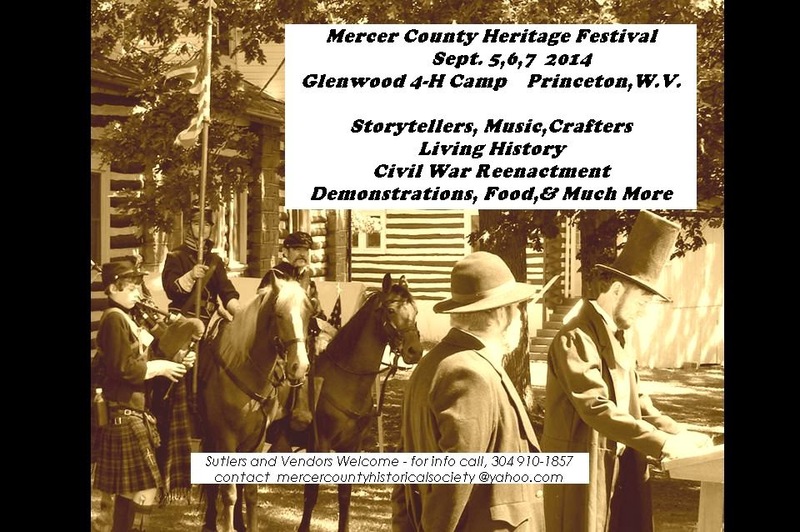 The Mercer County Heritage Festival in Princeton, West Virginia is going to be such fun this year, with storytellers, living history actors, reenactments, demonstrations, food, crafts, and music, plus so much more! There have been so many times when I've tried to do it all - whatever needed to be done, and then some. Seeking fulfillment in "getting things done." Searching for meaning in my own life by seeking to be a blessing to others. But the truth is that I cannot do it all on my own. The Lord has been teaching me in His gentle, persistent way that I can't live life in my own strength. I cannot do even what I know needs to be done without His grace and mercy to keep and sustain me. I am not sufficient. But He is. No matter how hard I try on my own to seek to obey His directions, I fail because I forget that these things have to be done in the Lord's strength and trusting in His Holy Spirit for the outcome. Resting in the Lord, being patient with my slow progress, seeking first His glory and kingdom, and consciously seeking to trust Him for the blessings of life instead of trying to earn them by obeying: this is something I thought I'd learned long ago, but recently have been convicted of on a new depth. But what a Lord! How kind He is! He doesn't tell His people to earn their salvation, but rather to obey Him as a way of showing gratitude for what He has accomplished for and gifted to them. What a gracious, merciful, mighty God! How can I ever praise Him enough? He is holy and righteous and true, and His ways are good. May I be given grace to follow Him more closely, and put no confidence in faulty flesh. Just some random quotes that I've been thinking about the last few weeks. "Sometimes we want things we were not meant to have. Because He loves us, the Father says no. Faith trusts that no. Faith is willing not to have what God is not willing to give. Furthermore, faith does not insist upon an explanation. It is enough to know his promise to give what is good--He knows so much more about that than we do." "...(P)eople also need to be filled with some sort of strong drive to have a family life no matter how much work and sacrifice it may take, to demonstrate what it to that is being lost!" "The modern young man will never change his environment; for he will always change his mind." "A faith untried is no faith at all," someone has said. Today I declared my faith before a hundred women and came home to a startling piece of bad news. Hopes were dashed, plans ruined, over a seemingly trivial thing. We did not know what to do. "Trust me" is always the word at such a time. "But Lord, we did trust You. You answered us and everything was working so beautifully. Now this. What shall we do?" "Keep on trusting me. That is my assignment for you tonight. Commit your way to Me; trust in Me; stand still and see." Why, of course, Lord! I see what You mean. How could I be sure I'm trusting You unless You keep giving me "pop quizzes"? These are the exams in the school of faith. This latest episode in the sheep saga has reminded me of a question I got recently which caught me rather off guard: why do I keep sheep if they are so much trouble? Wouldn't it be much easier to just get rid of them, or keep some other animal that wouldn't require so much work, or have so many problems? The short answer is, of course it would be easier not to raise sheep. It would be so simple to choose not to go through the pain and heartache that accompanies raising animals who often end up on the predator's plate. So why go through it? The long answer: Originally I started with sheep because my parents said I needed to learn responsibility, and sheep were (and are!) much less expensive than a horse, which was my first choice. But the sheep we got became pets, and when I got older it became apparent to me that I would miss them very much if I had to sell them. More than that, in learning responsibility the Lord taught me commitment. It doesn't matter if I want to go out and check on each of them every day - that is the job description. I agreed to do that by keeping them. Even in the winter. Even in a storm. Even when I don't feel like it. I am responsible before the Lord for their lives on my farm, and were I to neglect them it would be a sin. And you know what? The Lord gives grace even to adjust my attitude to feel like doing my duty when I ask Him to with a willing and open heart. It may be easier to get away from what makes me uncomfortable, like dealing with some of the problems the sheep get sometimes, but running away is not an option for a Christian. The Lord calls us to deal with the problems He allows us to face, and teaches us how to deal with them in the Bible. For the sheep, who know my voice and come when I call, my duty is to protect them to the best of my ability and to treat their problems to the best of my ability. No, I do not accomplish this perfectly in this life. But one lesson the sheep have taught me how important it is not to take the easy way out. Difficult situations are hard to face, but often when they are met with God's grace and dealt with God's way they become the basis for something so much better than I could have imagined before. The animals can be affectionate, and I still consider most of them my pets. They provide wool for me to spin, and help me see the bigger picture when my life feels claustrophobic. And the lambs are so cute each spring! Two weeks ago my family and I had the opportunity to attend the 11th Reformed Family Bible Conference. The theme this year was the book of Hebrews. Eight different pastors took turns preaching through the book over the course of four days, covering ten lectures. It was encouraging on many levels. The teaching was pertinent and applicable to our times and to me personally, besides having the joy of seeing good friends that I usually only see at conference. The sermons this year were expounding the book of Hebrews, extending courage and perseverance for weary Christians tempted to turn away from the faith. Here are two links to different sermons from the week. These last few weeks have been difficult, to say the least. Friday a week ago the courtship of which I was a part ended abruptly and unexpectedly. The next day, Saturday, a large dog attacked my sheep and ended up killing four of the lambs. It was heartbreaking to see the flock scattered and shaken, and the bereaved ewes calling for their babies. My father was the brave one, burying the dead lambs for me. He shows me how much he cares for me by taking care of the practical difficulties so that I do not have to, and I am very thankful for him. My brother also did some of the hard things, and encouraged me by his willingness to bear the load of icky jobs that come along with raising any animals. God does all things well. I cannot see the reasons for these hard times, but if I could, God's plans would only be proven more glorious and the end result better than I can dream right now. He has planned out history marvelously well, and all things, even (especially?) the difficult things work together for the good of His people and the glory of His Name. "Scripture invariably treats us a morally responsible agents," as John Stott put it in The Cross Of Christ. We grow closer to God in the stressful, difficult, heart-wrenching times because it is then that He shows us how we are not in control of our lives. It is then that He displays to us our need of Him to make it through another day. He uses our sins and the sins of others to grow us to maturity because we are basically lazy, and usually grow only when we are pushed to do so. To use a different metaphor, the shepherd uses some dogs to nip at the heels of the flock in order to keep them from the cliff, while at the same time calling the sheep to himself so that they know which way safety lies. According to Paul David Tripp, often times of waiting are sent to give us opportunity to grow in knowing God, to grow in knowing self (how sinful and selfish I really am apart from the grace of God), and new ability to serve others by sympathizing with them when they go through similar trials. So, although I do not understand, by the grace of God I do accept and will cling to Him as each earthly hope and wish fails. May His name be ever blessed, and ever honored.